There are still a lot of places in West Somerset that rely on local relays for terrestrial TV, the service from these is very limited, consisting of only a handful of TV and radio channels. Then again there are a lot of places that can’t get these either, this is where satellite TV comes in. If you find yourself in a position where terrestrial reception is limited or simply not possible…or you just require more channels than even the main transmitters can supply, then satellite may be the only option. I sometimes find that Sky will refuse to install a dish if it means too much work, for instance if the dish has to go above a certain height, or the cable run is too long. If this happens feel free to contact me, I will install the dish and cables, leaving the Sky installers nothing to do but install the box. Very seldom do I have serious trouble installing a dish and only once have I ever given up, this was on a property surrounded by very tall Poplars. There was no way a dish could be positioned to see over them, the only option would have been to put the dish on a post outside the tree line, but this would have involved burying a very long length of armoured cable and the cost proved too much. There was a similar instance in Roadwater where, had the dish been installed on the house it would have faced straight into a very steep wooded bank. I thought it was a lost cause until I discovered the customer also owned the steep bank. So it was in no way an easy job but a dish was attached to a post at the very top of the bank and the leads strung through the trees and across the drive on a guy wire. The result…satellite TV where they had thought it impossible. 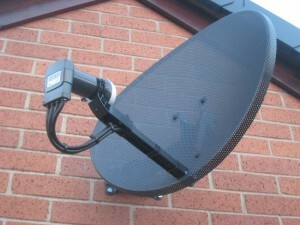 Please note, I only do Sky* and Freesat systems, I don’t get involved in foreign satellites or motorised systems. * I am not a sky installer and so cannot sign you up to sky products, but I can install Sky dishes, obtain Sky receivers or generally diagnose and rectify a non working Sky system.